In this post, I look at the two wards that make up Scarborough Southwest, Ward 35 and Ward 36. Ward 35, the north half of Scarborough Southwest, is a triangular ward bordered by Victoria Park and Eglinton Avenues and Metrolinx’s Lakeshore railway line. Ward 35 is represented by Michelle Berardinetti, who was first elected to city council in 2010, the spouse of Liberal MPP Lorenzo Berardinetti (who represents Scarborough Southwest at the provincial level). Ward 36, south of the railway corridor, straddling Lake Ontario, is represented by Gary Crawford. 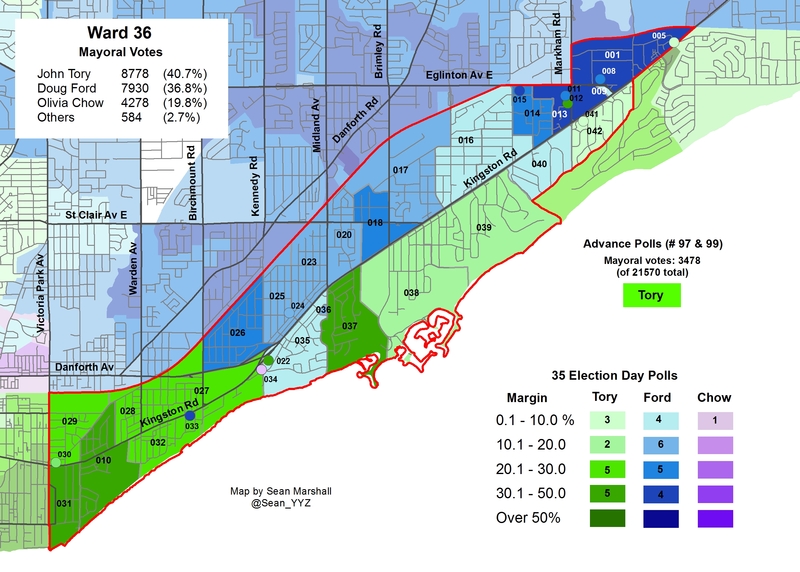 Unlike Ward 35, ward 36 includes relatively affluent neighbourhoods such as Fallingbrook (which neighbours the prestigious Beaches neighbourhood) and those abutting the Scarborough Bluffs. Ward 36 was the only ward in Scarborough where John Tory came in first place; Doug Ford was the first choice in all nine other wards east of Victoria Park Avenue. Interestingly, even though the dubious extension of the Bloor-Danforth Subway wouldn’t serve Wards 35 or 36 by any means, both incumbent councillors were strong supporters of the expensive project that replaced plans for the replacement of the existing SRT with an extended light rail corridor. Michelle Berardinetti won in 2014 with 63.2% of the vote, her nearest challenger, Paul Bocking, came in a very distant second with 14.4% of the vote, in a field of 9 candidates. Berardinetti started her first term in office mostly allied with the Ford agenda; one of her first accomplishments was having newly-installed bicycle lanes on Pharmacy and Birchmount Avenues (both mostly in her ward) removed. However, in 2012, she became part of the “mushy/mighty middle,” voting only about half the time with the Fords, and by the end of 2014, her political record could be described as centrist. 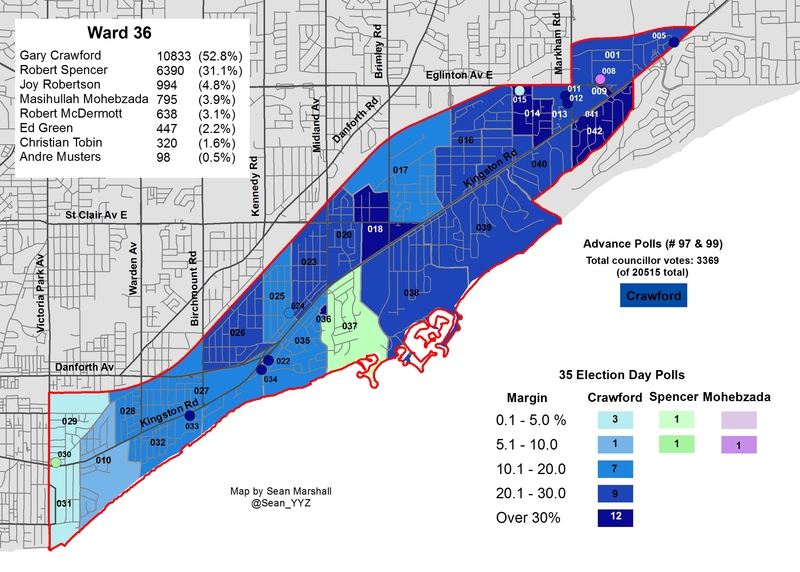 Berardinetti won every poll in Ward 35 by a comfortable margin. 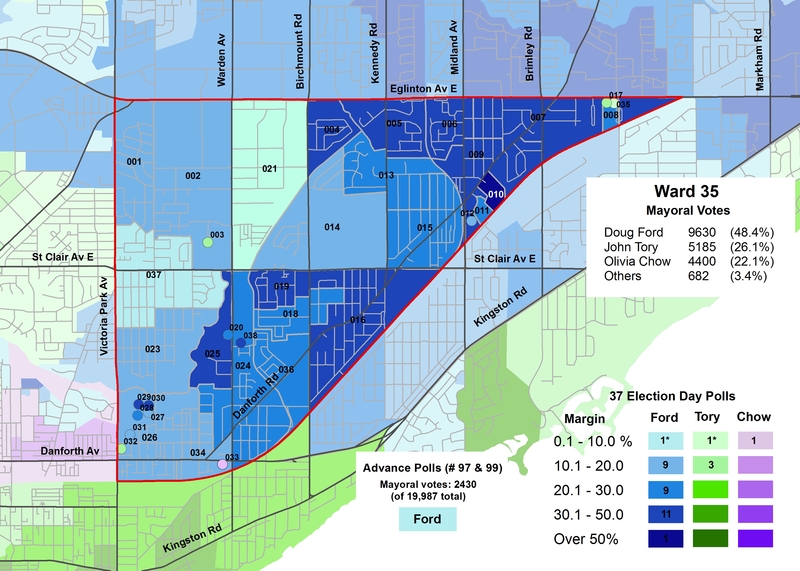 Doug Ford won all but five polls in Ward 35. Olivia Chow came first in Poll 033, a long-term care facility on Danforth Avenue. Tory came first in four polls, all either condominium high-rises or seniors’ residences. Ford’s best showing was in Poll 010, which, not surprisingly was a large TCHC complex on Gordonridge Place. Ward 36 is represented by Gary Crawford. Like Michelle Berardinetti, Crawford was first elected in 2010, replacing retiring long-time city councillor Brian Ashton. Before being elected as city councillor, Crawford ran in 2007 for the Ontario Progressive Conservatives. Crawford was a reliable Ford ally right through 2013; he even painted a portrait of the disgraced mayor for the Ford family in 2013, and performed many times with a band at the famous Ford Fests. Otherwise, he was one of the quietest of Toronto’s city councillors. Robert Spencer first ran in 2010, narrowly losing to conservative Gary Crawford in an open race, losing only by 422 votes in that election. Spencer is a former school trustee and past chair of the Toronto District School Board, so he is well-qualified for municipal office. Spencer does not support the Scarborough subway extension, and his platform was generally well to the left of Crawford’s. Unfortunately, Crawford’s support increased in 2014; he won with 52.8% of the vote, Spencer only took 31.1%. Over 4400 votes separated the two rivals in 2014. Crawford won in all but three polls, those that picked Tory and Ford alike. I suspect that the power of incumbency helped Crawford’s campaign enormously. This entry was posted in Election, Maps and tagged 2014 Election, Scarborough, Ward 35, Ward 36. Bookmark the permalink. I’m thinking it would be interesting to see a Toronto-wide map of the results in all tower polls, and/or specifically in TCHC towers. Definitely! Once I’m through the poll-level results for each ward, I’m interested to see how TCHC polls voted, as well as rental and condo towers. I’m very interested in the voter turnouts as well, but that’s a separate project. Your election maps are terrific Sean. I publish Birch Cliff News and am going to post your piece about Wards 35/36 to our Facebook page because I think people will find them insightful. I was surprised by your comments about Gary Crawford, however, as most folks out here obviously favored him over Robert Spencer by a large margin. The all-candidates meetings were very illuminating.